As much as I enjoy discussing the latest and greatest knives, sometimes we need to stop and appreciate the modern classics. As someone who tries to stay on top of all the new stuff coming out, I can tell you that the knife world moves at a breakneck pace. Companies are constantly introducing new and exciting models vying for our attention and dollars. As much as I can appreciate their desire to shower us with awesome new products, I try to occasionally pause and reflect on the real classics in the world of modern folding knives. Without a doubt one of these classic knives is the Benchmade Mini Griptilian. The little brother to the full size Benchmade Griptilian, the Mini Griptilian takes a lot of what makes the full size so great and shrinks it down into a package that is perfect for urban EDC. For most people this knife is everything you need, and nothing you don’t. Lets take a closer look at this “new classic” knife and see why it earns that designation in this review. 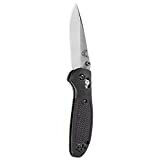 The Mini Griptilian has a 2.91″ blade, an overall length of 6.78″ and a weight of 2.5 ounces. These dimensions make the Mini Grip ideal for EDC. This is a knife that is small enough to comfortably carry, friendly enough to use in public without questions, and still big enough actually get some work done when you need it to. However, if you need something that is capable of bigger tasks can also work as a defensive knife, I recommend checking out the full size Griptilian. The blade on the Mini Griptilian is a classic drop point shape. This is a timeless design that features a hollow grind and a swedge. This gives you a nice tip for piercing and detail work, along with plenty of belly for common utility tasks. You have a choice of a satin finish (shown here) or a black coated blade. Speaking of which, Benchmade’s coating is very tough. It will show wear, but not that easily. They also make a tanto version of the knife, and you have your choice of plain edge or partial serrations. All in all, you have an excellent blade here, with tons of options to really make it your own. The steel on the Mini Griptilian is 154CM. This is a nice all-around steel. It’s not quite a super steel by today’s standards, but definitely a mid to high end steel. I like how it is easy to sharpen and how it holds a nice edge for a good amount of time. Speaking of edges – it takes an absolutely wicked one. I really like 154CM. The Mini Griptilian has a solid handle made of fiberglass reinforced nylon (FRN) over full stainless steel liners. Just so everyone is on the same page, FRN is fiberglass reinforced plastic. I have no problem with this handle material, although many consider it to be inferior to G10. It’s a lightweight and strong material that I have had a lot of experience with and have never had any issues (at all). Underneath the FRN we have nested stainless steel liners. This is a very solid handle design, and everything is lined up flush and is of high quality. Everything is bolted together for easy take down. Like the full size Grip, this is a closed back design. Ergonomics on the Mini Griptilian are good for a small EDC knife. With larger hands I was able to get a firm 4 finger grasp without an issue. It’s a tighter fit than the full size, but it’s definitely doable (and remember, this is the Mini). Of course, being a Griptilian, this thing is tricked out in the texture department. Benchmade included tons of jimping, a nice thumb ramp, a good choil, and a tight diamond pattern on the handle scales. This knife isn’t going anywhere – in forward or reverse grips. The pocket clip is the exact same clip found on the full size Griptilian, which is great. I am a huge fan of this clip, it’s a good size, offers good retention and buries deep. Benchmade gives you the option of ambidextrous tip up carry. The attractive flat black coating will wear off with use, but if you ever send this knife into Benchmade for service (or just email em) they will hook you up with a brand new clip. As far as actual carry goes, the Mini Grip is effortless. The knife is fairly slim and at 2.5 ounces you will hardly feel it. This is a knife that you will want in your pocket every day. Like the full size Grip, the Mini comes with either thumb studs or a thumb hole. I like the look of the thumb studs (plus it matches my full size Grip) so I went with that. Both options provide near effortless ambidextrous deployment. There are large phosphor bronze washers in the knife that account for the incredibly smooth deployment. Both my full size and Mini Grip rank the fastest deploying blades in my collection. Also, blade centering is perfect. As far as lockup is concerned, the Mini Grip makes use of the now legendary Axis lock. I’m a huge fan of this style of lock because it is incredibly easy to operate with either hand, is strong and is incredibly elegant. Hands down this is my favorite style of lock. The axis lock on the Mini Grip has been flawlessly executed. If you live in the US or Canada I really cant think of enough nice things to say about the Axis lock. However, if you are an international reader, you may need to consider that if the spring on the axis lock breaks (which has never happened to me), you would have to send in the whole knife for repair. This would be a hassle, and rather expensive. That is the only downside I can really see to the axis lock. Again, after owning dozens of axis lock knives and carrying some for years and years, I’ve never had an issue – but I do occasionally get comments from international readers saying that this has happened to them. It would be great if Benchmade reconsidered their policy in these conditions, and just shipped out a new Omega spring. Full Size Griptilian vs. Mini? Now if you are anything like me, you might be interested in the Griptilian series, but are unsure whether you want the full size or the Mini. To help you out I recorded a little video comparing the two knives. I hope this helps. The Mini Griptilian is an absolutely fantastic EDC option. It’s lightweight, sturdy, and very well made. It should be no surprise that this is one of Benchmade’s most popular and iconic designs. Perhaps the only issue is the price. This isn’t a cheap knife, but it is wonderfully made (in the USA) and I think you get what you pay for. I have had Benchmade knives for years now and they are quality tools. The Mini Griptilian is a knife with a proven track record and has earned its place as one of my most recommended EDC knives. I recommend purchasing the Mini-Griptilian from Amazon and BladeHQ. Please consider that purchasing anything through any of the links on this website helps support BladeReviews.com, and keeps the site going. As always, any and all support is greatly appreciated. Thank you very much. You can get it right now for about 60 dollars from Knifeworks.com (who are also very nice about international shipping). One question though, you sure that’s a hollow grind? I havn’t recieved the mini-grip I bought for my dad yet* but the one’s, both mini- and regular, I’ve seen have been flat grind from the grind-line. *One thing not mentioned in the review is that the Griptillian siblings like the Delica/Endura-series are available in quite a wide choice of colours. My dad’s not a knife-guy and us being Swedish we have a traditional fondness for knives with coloured handles (I think it comes from the Mora Classics and Sámi knives) but I don’t think he’ll mind the baby-blue mini I’m getting him. I’ve seen this trend become more and more pronounced in recent years and I appreciate it greatly. BM should be very proud fascilitating that. Lew, I will have to check that out! Thanks! I am actually not entirely sure if it’s a hollow grind. Either it’s a very shallow hollow grind or a flat one – sometimes my fingers fail me and it can be tough to really tell. It’s pretty close to flat either way. The colors are an excellent point, I’ll have to amend the review to include that. They do make this knife in a wide variety of colors and you are totally correct – it can make a big difference in the eyes of people not quite as comfortable around knives! Yep, as I’ve posted in your comments again and again, the Griptilian series is an standard in excellence. The minis make such a good blade for everyone. A great primary knife for folks with small hands or in enviroments that frown on larger blades, but also an excellent back-up for your sons and daughters being deployed overseas. Your photography makes me jealous. My camera(not to mention my abilities with it) is something on the order of crap. All, in all, a solid review. I enjoyed reading it. Thanks RK, I think we both knew the review of this one wasn’t going to have any surprises in it. But for the sake of being thorough I wanted to make sure it eventually found its way onto the site. Thanks man, the photography methods may surprise you! I’m using a 6 or 7 year old point and shoot camera. It’s mainly in the lighting setup (admittedly I have about $100 worth of lights), the tripod, and my home made light box. I’d be happy to email you a picture of what the setup looks like if you’re interested. It was a review that needed to be done, Dan. The Mini-G is too important a blade not to have a review on. Sure! I’d appreciate it. Though I don’t think a light box will work with the beam shots I’m working on. I’ll be forum hunting for those answers. I totally agree. It’s also important for comparison reasons. Eventually I’d like to have solid reviews of all the classics. I’ll put something together for you and get it heading your way later this weekend. Love the review, I have the blue one and I carry it more than any in my collection. Even non knife people think it is a cool knife. I hope to see you review the walnut bone collectors soon. I have the large folder and it is a serious work horse. I don’t believe in babying knifes, it they break I will buy a new one. I have thumped on the bone collector hard and it just laughs at my efforts. The blade steel is rediculously thick and the weight and balance of the knife are terrific. With all that said the walnut handle is one of the most beautifully done handles in the knife world. It is unbelievable for a production knife. Just perfect. Also the smoothest deploying benchmade that I own. Thanks again and I love the site! Thank you John! I have a lot of knives at this point and my Griptilian still gets tons of pocket time. I carried it over the weekend actually. I really do love this knife. So fast, so smooth, great size and very rugged for its weight. New Mini G should be here today. Itll be my first Benchmade, as i’ve become a lover of the Spyderco Delica 4 the last few years. I’ve always liked the extra ability a partially serrated seems to give me, but have switched to plain edge as of late. Love your site!! It’s great that you are able to explain a little about what to expect with all the different kinds of steel out there. Now it’s not just random numbers! Thanks! Congrats Brandon! Enjoy that mini Grip, it’s an excellent knife! I think you will find it’s a nice change of pace from the Delica, another classic. Been carrying my new Mini Grip for a few days now. Been a little low key lately, but have gotten to put it to some use. Getting used to the stud deployment, but even with my smalish hands its great to use one handed. The axis lock is as great as well. Not to mention a great edge! Definiatly going to be a regular in my EDC. Thanks again! Hey Brandon! Glad you are enjoying your mini-grip and thank you for the update. Carry it in good health my friend. Thanks again. Thanks for the review Dan, been looking into the Grips for awhile now, still trying to eventually get one. But as far as pricing, CutleryShoppe.com is some of the best when it comes to Benchmades, I believe this model of Mini Grip runs for about $57 on there. Thought I’d just share the savings! Have a good one! I just purchased the version by Doug Ritter Orange Mini Griptilian RSK MK1 Stone Washed S30V Blade. Looking forward to receiving it this week. Thanks for putting in all the effort and time to keep this site going! Congratulations! The Doug Ritter version of the knife is extremely nice. I think you will enjoy it! Be careful there in NYC. Thank you very much, Hieu! If you are in public service (LE, Military, First Responders) here is a 30% off coupon: NRALOD2013…you may need to sign the “Auto Knife” waiver. Not sure how long it’s good for…guessing through at least 2013 as I just used it on a custom Mini-Griptilian I ordered. Thanks for the heads up, Dave! Looks like a nice deal for a custom grip! The mini Grip 555 was my first Benchmade. That’s the one with the hole rather than the thumbs stud. It’s also the knife that made me fall in love with Benchmade and the Axis lock. I used this knife for many years as my sole EDC and then I lost it. I eventually bought another and naturally found the old one a few days later. The handle material is amazing! The only way I could tell the difference between the two knives is the wear on the screws and pocket clip. The scales are virtually indestructible. Not a single scratch between the old and the new despite sharing a pocket full of keys and other paraphernalia. In a moment of weakness I ordered a full-size grip custom made by Benchmade. At the time I worked in a lab with mostly women as coworkers and I would get the hairy eyeball whenever I pulled out a knife to open a package. So as an experiment in human psychology I ordered a full-sized Grip with an S30V Black coated blade with hot pink scales. Gone were the hairy eyeballs and half the girls in the lab owned one within a month. It’s truly amazing how much the color of the scales can change people’s perception. A yellow mini Grip scared them while a full sized hot pink Griptillian was cute. I fully Believe in the equality of sexes but sometimes the female mind boggles mine. I just got my new Mini Griptilian with blue handle scales in the mail today and I love it! Dan, thanks for the review and the comparison between the full size and mini-size. I’ve been spending the better part of a month (am retired) trying to figure which knife, and which version, to buy. I’ve got arthritis and cannot close my hand, and have no strength in middle and ring fingers. From your video I worked out that I would not be able to get a firm grip on the mini griptilian so have settled for the full sized. Thanks! My girlfriend’s father also suffers with arthritis in his hands. Ultimately he bought a Mora fixed blade for daily carry. But his situation is likely different from yours, so I want to congratulate you on the choice of the full size Griptilian. It is an excellent knife, and likely the right choice based on what you have described. The mini Griptilian is quite small. Not a great choice if you have limited dexterity. Please let me know what you think of your full size Griptilian if you get a chance. I’ve got multiple full-sized and mini Griptilians (all but one are Doug Ritter models, in S30V and M2 tool steel, plain and combo-edge). All of them have been carried EDC for a while, and I rotate through them regularly. I like them so much I sold all my other knives! The full-size is nice and beefy, but I am not convinced arthritis-sufferers must buy it. Yes, there is a lot more surface area to grab on to, but the Mini-Grip is not too small to grip. The scales are a bit “fat”, so it does not require crimping one’s knuckles into sharply acute angles just to hold. Also, the full-size is noticeably heavier, and the blade size makes it much less nimble and much less practical than the Mini. And the plain fact is that I get a lot more “hairy eyeball” looks with the full-size than the Mini. I noticed, as Mark mentioned above, that color and look does matter–my scary all-black combo-edge Mini-Grip gets a lot more attention than my less-scary (but still scarier than pink) safety-yellow plain satin Mini-Grip. I am considering ordering some pink scales as Mark tried, to cut down hairy eyeball looks further. A note on hollow-ground vs. flat ground. The most common Pardue drop-point Grip and Mini-Grip blades are flat-ground, but Benchmade does offer a hollow-ground version, as well as an American tanto version. Ritter’s drop-point is flat ground. I would recommend most people who EDC get the Mini Grip in an innocuous color, especially in urban environments, whereas for actual survival/bushcraft use, get the full-size Griptilian. In either size, get either the Pardue or Ritter drop point, satin finish, plain edge, but never the tanto (too scary-looking, too impractical, too hard to sharpen).